I have recently pondered on the fact that in the past few months I have spent more time considering the curriculum, the attainment gap and all matters on educational policy than I ever did during my years of teaching. Perhaps that is because, like colleagues across the country and the world, I was so busy with the everyday lesson planning, target setting, marking and well-being of my pupils that the policy-building side was something abstract and distant. Often you go through the motions without asking the bigger questions - the why. The "how do I do this" was always there, but the "why do I do this" was missing, the wider picture. Being a reflective practitioner is something teachers are always encouraged to be but all too often workload and time restraints do not allow for the amount of reflection that is really needed. When the Curriculum for Excellence was introduced just over a decade ago it was met with much fanfare as being revolutionary in its thinking and how it would change the way education was delivered, children learned and open up endless creative opportunities within the classroom. However, whilst politicians are more or less unanimously agreed that CfE should remain in place, there are increasing calls for a radical rethink and reconsideration of its delivery and a need to ensure it remains relevant in an ever changing world. 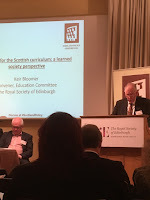 Falling exam performance, declining PISA scores, excessive mountains of paperwork, jargon, lack of clarity between agencies (think SQA and Education Scotland) have all left many a teacher demoralised and many a politician calling for the need to depoliticise (irony?) the curriculum and get education fully back on track. Prof Graham Donaldson spoke of the danger of the "improvement trap" - there is a better understanding of high quality learning at both the local authority and the national level and collaboration but the risk is that all the work is for a set of purposes that are now less relevant therefore, there is a need for continued debate and review. The global pace of change means that change must continue to happen at the educational level, it must be an evolutionary process and with increasing both interdependence and competition the employment prospects for school leavers continue to alter - the curriculum has to prepare young people for that. One of the first questions posited to the audience was - what do young people become as a result of all the learning - or how do we balance the small world of curricula with the big world of learning? Which goes far beyond the school and learning is, indeed a life-long process. I cannot provide a one paragraph answer here and nor did the panel, it was more open-ended up subject to thought, consideration and to take away and reflect upon. Whilst the "attainment gap" and the closing of it is a common and central theme now of any educational policy discussion, what I hadn't heard discussed before was the "experiential gap" - the experiences that young people have that develop their understanding of the world, their relationships, their aspirations and their own characters - in many cases, due to family circumstance, this is only available to be developed at school - is school always doing that? Is it the right environment to do this or does more have to be done to work with families to close this gap? Again, this isn't an attempt to answer a question it is more to think and reflect. One point that came across succinctly was that we need a national conversation not a debate. I would agree, there has been too much debate, too much arguing and too much of the Scottish Government "do as we say" top-down approach. Young people themselves, being the main stakeholder, teachers and headteachers all need to be included in that conversation. I would also argue that industry needs a place at the table too - as the market and supply and demand changes, the curriculum whilst developing key skills in literacy and numeracy must also adapt. Nothing should be static. 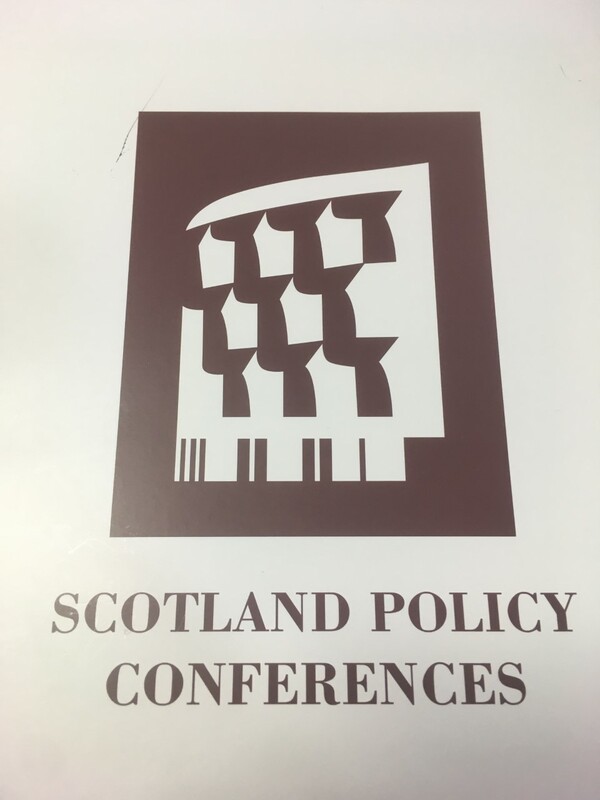 Experiences & Outcomes - anyone who has taught in Scotland in the past decade will know this term only to well, commonly referred to as the "Es and Os". In any walk of life if we are to have an experience can we determine the outcome prior to the experience? Therefore, why is the Curriculum for Excellence loaded with pre-determined outcomes to all experiences? That question was posed by head of Clifton Hall School, Rod Grant. We appear to be evidence driven with targets and outcomes - there is more of a focus on the outcome than the learning. I felt like shouting out - yes, this is exactly what I was saying particularly in the two years I was teaching prior to being elected. Working in education for youngsters with additional support needs (ASN) there was a focus on life skills, on giving the youngster the experience. Many ASN children will not ever be able to live fully independently and many will have limited experiences of the workplace. This is not to say we should not work to realise their full potential, but the development of life-skills are just, and I would argue, more important, than ensuring they have ticked the box to have achieved National 2 Maths. I often found that in the drive to complete the paperwork, to tick the boxes much of what I was doing when teaching in ASN was to push pupils to get their National 2 English and Maths - and to what end? The stress that it often caused them without a full understanding of how this would future proof their work prospects? "Teaching to the the test" we kept being told is not what we were there for. More often than not it felt like that. A list of short and long term targets of where they were at point X they outcome they would reach at point Y and as a result progress to Z. No. Life is not like that and particularly for the differing and varying of complexity of additional support needs the youngsters had. Data collection kills learning - how gladdened I was to hear those words expressed. 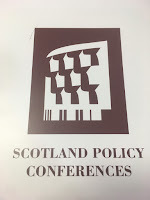 * Developing national policy locally - in the Scottish context, will this remain? All of that made for positive sound-bites but again I pondered, where was the accountability? Perhaps the Wales initiative has worked. Currently I am not in possession of evidence to determine if that is the case. However, cautionary notes were - the consortia must have a local flavour. Voices must be heard - parents, teachers, communities - as so often in education - communication is key. Does competition and competing aims and objectives get in the way of collaboration? There has to be a balancing act between meeting the needs of the individual school and at the same time one coherent, workable message to all within the consortia. Are the local authorities priorities still met? What is the role of locally elected representatives to scrutinise policy? Next week the Kirkcaldy Area Committee will sit and the papers bring an annual report on Attainment & Achievement - elected representatives scrutinise these papers, we ask questions, we seek answers. Will this still happen once the Regional Improvement Collaboratives are established and the only link with the local authority is the chair/convenor of each Education Committee in the collaborative? Again, thinking of Keir's comments - why no piloting? Perhaps because piloting never fits comfortably with a top-down approach. A number of other topics were considered, including early years provision, which I believe is central to many of the building blocks of education and was pleased to see it be given the coverage it has lacked for too long. However, I would prefer to write a separate post on that as I feel it does not do the sector justice to cover it in a few lines here - what appeared to be an argument for formal provision was given and a counter-viewpoint that excess hours in a formal setting is not always conducive to the development of a child. * Parental confidence - this apparently lessens as children move through school - why? Tuesday was undoubtedly the type of day I enjoy, when not out in my Ward and meeting and talking with constituents. It had a flavour of academia which to me, is always a valid and valued way to spend the day. Indeed, I began this post talking about life-long learning and the quest for knowledge and answers probably explains so much about my chosen career as a teacher and then going into politics. No doubt this year will bring much more thoughtful and fruitful debate and discussion as the Education Bill moves its way through parliament.